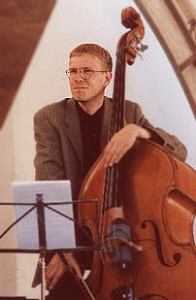 Hans is one of the most frequently heard double-bass players in Sweden. He was born in the town of Karlstad, Sweden in 1966. Even though he is relatively young he is one of the veterans of the instrument. At the age of eight he started playing the classical guitar but when he was twelve he started playing the fender bass. His teacher, however, made him give priority to the double bass. He was then eighteen "Since then my old Fender has bee in the wardrobe", says Hans. At that time he listened to jazz of the kind that was played by groups such as Steps Ahead, Weather Report and Pat Metheny. Later on, when attending the festival at Skeppsholmen in Stockholm, he heard the Count Basie Band conducted by Thad Jones and Mel Lewis' Jazz Orchestra. That night he decided to go in for music whole-heartedly. In 1986 he settled down in Stockholm and started studying music, at for first one year at a high school and then for three years at the Royal College of Music. At that time he also started playing with various groups. In autumn 1991 he toured in the US and in Canada together with clarinet player Putte Wickman, pianist Gösta Rundqvist and drummer Ronnie Gardiner. This led to frequent engagements with Putte and Ronnie including a tour and recording with Putte and Buddy DeFranco. Just previ-ously he had toured with Scott Hamilton and Claes Crona. He was also a member of the first edition of the Esbjörn Svensson Trio, EST. Among the double-bass players he admires and who have been an inspiration to him he feels that Ray Brown and the Dane Jesper Lundgaard are the most outstanding. After these two he mentions Christian McBride, Sam Jones, Ron Carter, Richard Davis, Oscar Pettiford and Jimmy Blanton and, on home ground, Lars Danielsson and the late Sture Åkerberg. When it comes to other instrumentalists, the list of names becomes very extensive, including for instance Thad Jones & Mel Lewis, Chet Baker, Stan Getz, Miles Davis, Oscar Peterson, Jimmy Rowles and Hank Jones. Among the younger musicians he mentions - among others - John Scofield, Joe Lovano, Jerry Bergonzi and Nicholas Payton. And he gladly hoists the blue and yellow flag for trumpeters Jan Allan and Johan Setterlind, saxophone players Joakim Milder and Magnus Lindgren and pianist Lars Jansson. Composing has never been his prime ambition. He favours playing the standard repertoire, which has infinitely so much to give and can be developed further. And for the time being he has no plans to form a group of his own. "I play with so many groups where I get some individual space so I have no need to create a group of my own. But of course, in the future I might take the chance to have my own group". As can be seen Hans is very much in demand and in a way it might seem somewhat presumptuous for him to express an opinion on the Swedish labour market. "After having settled in Stockholm I went to the jazz club Fasching. There were about thirty people in the audience to listen to the world star, double bass player Red Mitchell. I really started thinking about the music profession and how many weeks I could manage to get by before I'd have to find myself an 'ordinary' job. But now I believe that the employment situation in general has improved and more and more people are experiencing a spirit of optimism. Now you can find records in the shop-windows with folk music, world music and jazz, something that I don't believe would have been possible a couple of years ago. It's the small independent record companies that publish probably the most interesting music, and you will find that concerts are being held in smaller clubs instead of in giant arenas. I believe that this in some way has been to the advantage of jazz music." Hans believes that Swedish jazz has for long time enjoyed a solid reputation abroad and now it seems as though even more opportunities will be opened up on that front. When playing with the Arne Domnérus Quintet to a full house several nights at Ronnie Scott's in London - in connection with the Swedish Jazz extravaganza in that city in 1999 - he found that there were many visitors who knew much about Swedish jazz. And that such an excellent guitarist as Ulf Wakenius plays with such great celebrities as Oscar Peterson and Ray Brown will certainly not diminish the interest in Swedish jazz abroad. Hans himself has played a great deal with foreign musi-cians, for instance, Toots Thielemans, James Moody, Buddy DeFranco, Scott Hamilton, Warren Vaché, Horace Parlan, Frank Vignola, Maria Schneider and Ken Peplowski. Nowadays Hans is in great demand. You could say that almost any group and any big band seeks his participation, examples being Stockholm Jazz Orchestra, Anders Berglund Big Band as well as the Swedish Radio Jazz Group with Clark Terry playing Ellington music. Up to now he has appeared on more than thirty records. - And, for his taste, should an offer to play in a trio with pianist Kenny Barron and drummer Lewis Nash or Al Foster arise ----well he wouldn't refuse! (Partially based on an interview by Göran Olsson in [jazz stage] Sweden 2/1999).